In my sixth grade integrated math and ELA class at Quest to Learn, students play a board game called Caterpillar to learn about probability and statistics. As a founding teacher at the NYC public school with a unique game-like learning model (currently in its fifth year), I have worked through many iterations of this game and how it affects students' mathematical experience over the years. Caterpillar offers a great example of how to level your students up through any game so that they master the gameplay, master the learning goals, and apply what they've learned in one seamless experience. Caterpillar is a two- to four-player board game, played with colored blocks, two dice, and a frequency chart for recording each dice roll. The goal is to build the longest caterpillar with blocks by the end of the game. Each player begins the game by placing two blocks on any two mushroom spaces they choose. Each turn consists of a player rolling the two dice and recording the sum on the frequency chart. Any player with a block on a mushroom space touching the sum rolled receives an extra block of his or her color. Each turn also includes the opportunity to place accumulated blocks in order to build the longest caterpillar on the board. The game ends when there are no more spaces available on the board. Players then reference their dice rolls on the frequency chart to determine the most frequently rolled number. That number is the "bird," which eats the caterpillars at the end of the game. Players must remove pieces from any space around the number that has been determined to be the bird. The player with the longest caterpillar intact at the end of this explosion is the winner! Due to the content level, Caterpillar is most appropriate for middle school grades (6-8). 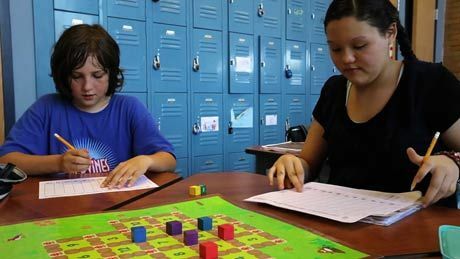 The learning goals in Caterpillar are for all students to master the related probability and statistics content by developing strategies to win the game. How to: Through the first few game plays, your students might begin to realize the distinction between a "good" and "bad" first move, based on where they place their first two blocks on mushroom spaces. You can help students notice that these spaces correspond to the most and least frequently rolled two dice sums, which is a concept that students are introduced to in the game, as they start noticing that sevens are rolled much more frequently than twelves, and so on. Students quickly make the visual connection between the theoretical probability of rolling two six-sided dice many times and the experimental probability of the same event through rolling the dice in the game and recording them in the frequency chart. Have all classes record each dice roll on a larger frequency chart in the classroom, and a bell curve begins to appear as classes compile all the data through many rounds of gameplay. This allows students to make connections between the traditional content and the real world experience of the mathematics in games. The ultimate goal in Caterpillar is for students to apply their mathematical knowledge by working together to develop modifications to improve the game. This challenge embodies one of my favorite phrases: "Math is a verb." Students are asked to do new things with the mathematics they're learning, and it looks different to each student. Ask students to make a simple modification, like filling in a blank game board with new number positions. Identifying the components of the original game that they enjoy and wish to keep in their modified version. Brainstorming around the components that they wish to modify, delete and/or add to the original. What happens to the game if you use three dice instead of two? What if you use four-sided dice? This modding project allows students to stretch their understanding of the mathematical concepts in an engaging, challenging context that reflects their interests as both gamers and designers. 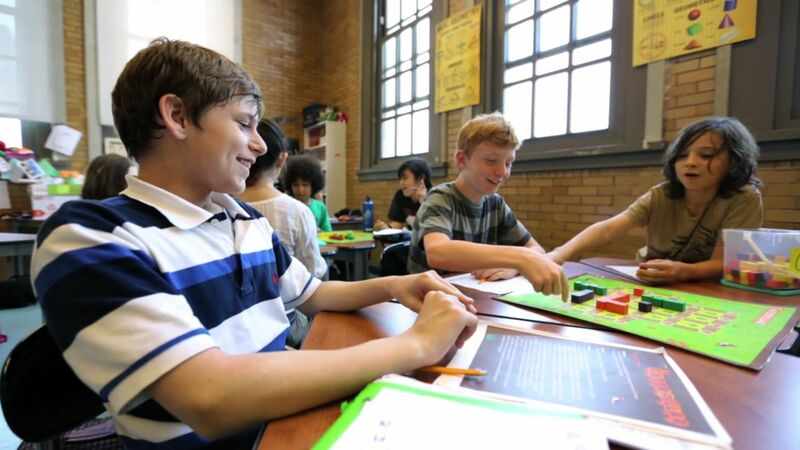 Having ownership of their mathematical explorations allows students to develop and sharpen their existing skillsets in order to meet (and hopefully exceed) new challenges. Through experiments with setting appropriate goals and increasing expectations for students by providing different levels of challenge in a lesson or activity, you can model the process of continuous learning, and help students learn how to keep challenging themselves. Games like Caterpillar allow students to proceed at their own pace, to fail and fix the mistakes they make, and to ultimately give real value to mathematics through experience. Math isn't something you learn -- it's something you do. Download the Caterpillar game board (PDF) and game-play instructions (PDF) to use in your own classroom. And please share your ideas, tips or feedback in the comments section below.